Ábhar dochtúra as Éirinn ba ea Kevin Gerard Barry (Gaeilge: Caoimhín de Barra; 20 Eanáir 1902 - 1 Samhain 1920) arbh é an chéad duine a chuir fórsaí na Breataine chun báis tar éis cheannairí Éirí Amach na Cásca. Bhí Barry i mbun staidéir sa Choláiste Ollscoile i mBaile Átha Cliath a bhí lonnaithe ar Ardán Phort an Iarla an tráth úd. Daoradh chun báis Barry de bharr go raibh lámh aige in inlíocht de chuid Óglaigh na hÉireann a raibh triúr de shaighdiúirí na Breataine Móire maraithe ann (ionsaí ar an 20 Meán Fómhair 1920). Tar éis dó foghlaim faoin bpianbhreith báis i bPríosún Mhuinseo, scríobh sé litir chuig cara leis; chuir sé in iúl a “sad grá from me to all the girls in UCD”. Tháinig a bhás seachtain i ndiaidh bhás Thraolaigh Mhic Shuibhne (a bhí ar stailc ocrais). Mar sin, tharraing an dá bhás aird ar chúis na bPoblachtánach. Cumadh amhrán dar teideal Kevin Barry a ríomhann eachtraí an fhir óig. Ainmníodh Cumann Fhianna Fáil i UCD as (KBC nó Kevin Barry Cumann a thugtar air). ↑ Séan McConville (2005). 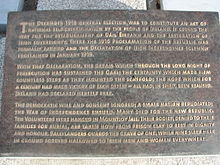 Irish Political Prisoners, 1848 – 1922: Theatres of War. London: Routledge. ISBN 0-415-37866-4. ↑ Liz Curtis (1995). The Cause of Ireland: From the United Irishmen to Partition. Belfast: Beyond the Pale Publications. ISBN 0-9514229-6-0. Tugadh an leathanach seo cothrom le dáta an 1 Samhain 2017 ag 12:50.